Each academic discipline at UNCG is assigned a liaison or subject specialist from the University Libraries. Liaisons collaborate with their units on information literacy, faculty research support and scholarly communications and ensure that the Libraries have resources that support teaching and research. The ethos of liaison work is a mindset of outreach to and proactive engagement with UNCG students, faculty, staff and administrators. Liaisons also work with alumni, other researchers, and community members. 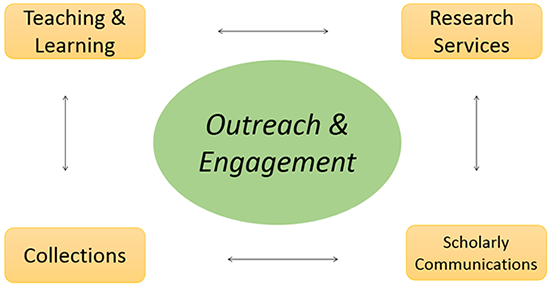 This outreach mindset permeates all four functional liaison roles described below. Serving as faculty fellows in the areas of Entrepreneurship, Sustainability, and the University Teaching and Learning Center. Developing and publishing open-access journals such as The Journal of Learning Spaces and Partnerships: A Journal of Service-Learning and Civic Engagement. Reviewing PhD candidates’ literature reviews before they go forward with their writing. Providing over 1500 individual or small group research consultations in an academic year to students, faculty and staff. Collaborate and establish partnerships in research, teaching, advocacy, etc. List of Liaison Roles and Responsibilities.